... along the Viennese Mariahilferstraße ('Romero' and 'mall', do I have to say more?). What a beautiful spring day, what a delightful shopping street. More than enough clues provided for a critical leftist mind to ponder on life in the year 2004. There I spot a KARE-Shop. It offers average interior design for average people with an average ambition in interior design. Let's have a look and find out what's congesting the market these days. Hmm. no - even worse - my credit card. For lack of cash. Never before have I come across an incarnated metaphor of the perfidy of our time more beautiful than this one. 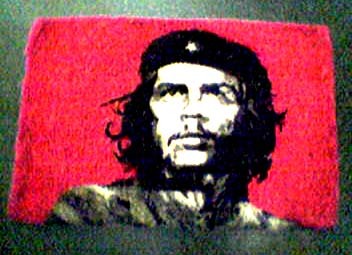 A doormat with the famous photograph of Che Guevara on it. Capitalism has an incredible advantage. It is able to simply assimilate subversive trends, to dissolve opposing signs and emblems, re-encode them and set them free again, neutralized and eclipsed. So I pay 22 euros and 60 cent for a dingy doormat with Che on it, wondering how many thousand percent of profit margin there might be for the chain. So I actually pay money for the possibility of trampling on leftist iconography. Every single step of mine will enfeeble the once strong and powerful emblem further. Do I like it? Sure do. The mat is cool. This is capitalism. And I am its blasted despicable servant. I will rot in hell for that and several hundred abdominous Umberto Ecos are gonna spit blood at me - forever.